As we waited in anticipation, instruments sat quietly alone on the backlit 9:30 Club stage. Just the basics for folk artists. A drum set, a cello, three guitars and a banjo. 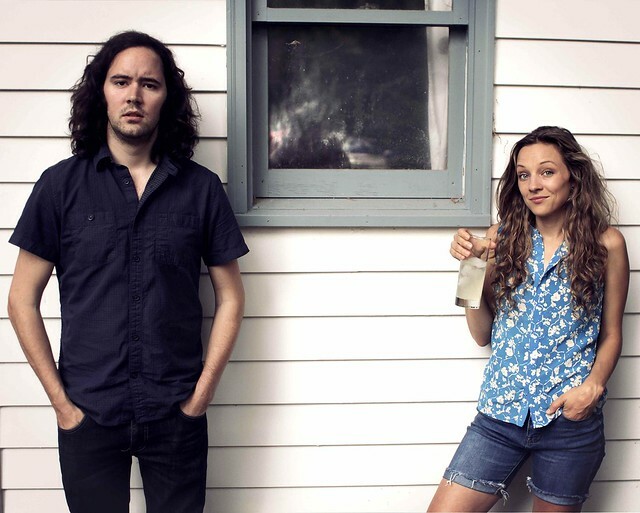 The picture before us was spare and melancholy, not unlike that of Mandolin Orange’s style of folk and Americana music. When the band did enter the stage (on time – 9:30pm) and take up their instruments, the chill crowd perked up into a spirited stir. Mandolin Orange is Andrew Marlin (vocals, mandolin, guitar, banjo) and Emily Frantz (vocals, violin, guitar) from North Carolina, along with three supporting band members for this show. With the instruments gently strumming, Andrew started us off by quietly singing the lyrics of “Take This Heart of Gold”. It’s an affecting song and set the tone for the evening, of profound and sometimes heart-wrenching pieces of musical poetry. The crowd did cheer and clap for each song throughout the show, but always below the clamorous release of an amped up rock show, as in deference to the mood previously attained. They released their fifth album, Blindfaller, back in 2016 and they are continuing to tour on its bonafides. And its bonafides are worthy, as they performed seven songs from that album, of the 16 they played total. The next song from the new album flowed into “Hey Stranger” as the mandolin plucked over the ‘there’s no burden greater in life’ refrain about losing family and friends through your own actions. Later in “Cold Lover’s Waltz”, Emily sang lead vocals for one of only a few times, routinely she simply complemented or sang back-up lyrics. The songs where they both harmonized together where often the more powerful. Something that amused me immensely was how much Andrew reminded me of Dave Matthews when he was plucking on the banjo or guitar – his mannerisms and he even looks a little like Dave. Okay, that is a compliment. One of the highlights on the instrumental side, they played one song without words, and it was a fast banjo and fiddle battle between Andrew and Emily, that even left the crowd breathless. They came back for the encore to play Bob Dylan’s “Boots of Spanish Leather”, which they assured us they reserve for specials nights. And surely playing at the 9:30 Club in DC is the most special of all special nights. I’ll take more of this. If you haven’t yet picked up a copy of Blindfaller or any of their previous albums, I suggest you do so. Now. And look hard and act fast for tickets for the next time they play for us in DC!